Love to travel in our RVs and meet new people. My hubby, Jim, and I have been RVing for over 20 years. We’ve had van campers, pop-ups, Fifth wheels, motorhomes, and pull trailers. Most of our traveling is done now in a 29 foot Newmar 2011 motorhome. We love it and so do our 2 kitties. We’re usually on the road over half the year. We lived in Alaska for 8 years, and drove the AK Highway a number of times. We can possibly give you some pointers about that. Jim has taken an RV repair course and is also a certified RV inspector. 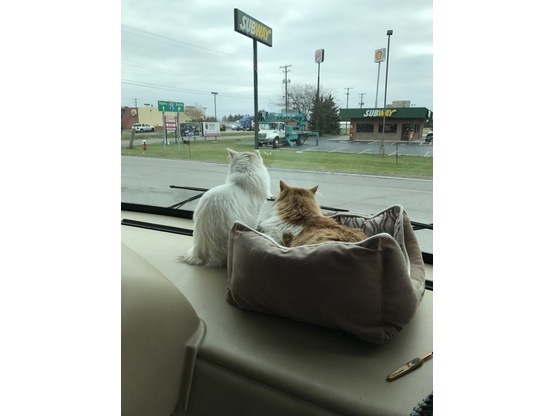 We have 2 fluffy fur babies who travel everywhere with us. 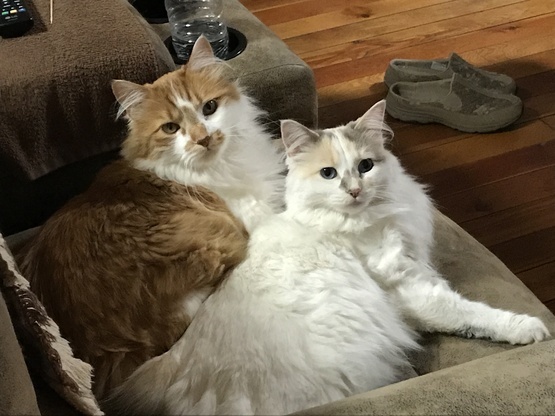 Buddy is a large, sweet ginger and white boy and Abby is a small, mostly white dilute calico. They make quite a pair lounging on the dash as we travel along! We have 2 slides, smaller one on the curbside, larger on the roadside. Our Seely Lake hosts were amazing and welcoming. We enjoyed meeting and getting to know them! And the house is right next to an ice cream parlor - yumm! Wonderful! They were very friendly but not overbearing. They are the kind of couple that you hope to run into on the road again someday. Their property is right next to the town so it's easily walkable and a short drive to Lake access. We had a lovely time boondocking on Jim and Cindy's property. The children loved the cats and the ice cream within walking distance. We spent our time at the lake relaxing while the children played and splashed. It was the perfect break after our busy days in Yellowstone. Nice couple would stay again if available! Convenient locatiin at the lovely Seeley lake. The hosts (and the cats😎 )are welcoming and very nice. Great spot! 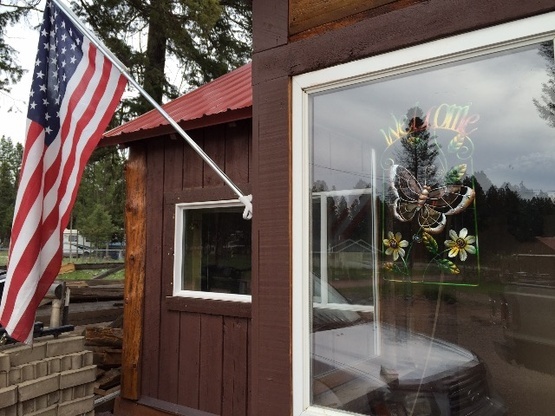 Travelcat's location is easy to find, level parking and convenient to the small town of Seeley Lake. Enjoyed talking with host and sharing stories of all their travels. The area is beautiful with lots of outdoor activities located near by. Hope to be able to come visit again. Jim and Cindy aren't always home - they travel a lot - so I was fortunate to get there when they were there. Delightful hosts with plenty of space - within walking distance of ice cream! Who could ask for more? We had reservations at a campground in Seeley Lake but I was concerned that we would not fit with our 45ft motorhome. 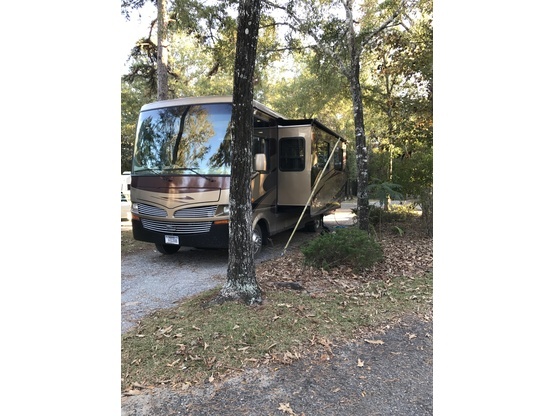 I contacted Travel Care to ask about staying at their site and she was very gracious and agreed we could stay there if the campground did not work out. She got back to me immediately every time we were in touch. Did not end up staying at her site but greatly appreciate her flexibility and offer of a space if we needed it. Jim and Cindy were great! I loved my little secluded spot beside the house tucked in next to a little shed. My windshield was shattered by flying truck debris on my way to their place in Seeley Lake, I was able to find a replacement in Missoula and had to stay for a couple of extra days for my appointment. Jim and Cindy went out of their way to make sure all was well and I was able to get my windshield fixed before moving on. What a wonderful stop on our trip. Jim and Cindy are such nice people and very accommodating. We enjoyed good conversations and got some good ideas from them on future travels. Their site is level, no work needed! Deer roaming right up to the camper. Very short walk for dinner. Highly recommend Dreaming at Seeley Lake! Travelcat and her husband are super friendly & accommodating! Even though they were traveling themselves, they gave us permission to boondock in their driveway on our way up to Glacier NP. The location is easily accessible off the main road and close to some shops and restaurants. We went on a walk for ice cream and when we returned, so had they! It was so great to meet them and chat about their trip and other experiences on the road. They were so kind to us and our children! Close to the Lake and ICE CREAM! We enjoyed a relaxing overnight stay in Seeley Lake, even thought our hosts were traveling too. So appreciate that they allowed us to boondock in such a pleasant place. Great spot to just hang! Cindy was gone on vacation, but she kindly allowed us to park our rig at her place anyway. 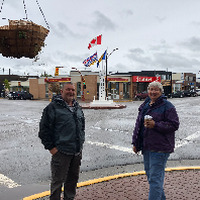 Seeley Lake is a super busy little town this time of year, but it's still fairly quiet during the day and very quiet at night, so you do get your rest :) Thanks, Cindy and safe travels to you! Though Travelcat was away on holiday to the great north, she was nice enough to allow us to stay on her property for 3 nights on our way to Glacier NP. The town is about an hour and change from Missoula where we went one day to resupply. Grant ghost town and multiple lakes are very close. I recommend the canoe trail right in town. Walking distance to ice cream which is super important. Hopefully next time we are in the area we can meet our hosts. Thanks again. I really appreciated the spot because it gave me the perfect place to jump off from! I was able to get the lay of the land and pick the spot that was right for me! It's close into the village. But still really beautiful! I feel so badly for the people in places where there are forest fires. There was plenty to see here in spite of the smoke and the locals were so nice despite the stress they were under. My husband, dog and I had a wonderful stay here in Seeley Lake. Our hosts welcomed us to stay for two nights and offered both water and electric hookups! They were incredibly friendly and accommodating and fun to chat with about travels and RV-life. Sadly the Rice Ridge wildfire is going strong just outside of town until perhaps October 2017, which makes for a smoky stay, but it really depends on which direction the wind is blowing. There's a great little ice cream and burger spot just behind the house, and a laundromat with hot showers across the street for $1.50! Seeley Lake is just across the street, although it was closed for the fire airplanes to scoop water. We also saw deer mill about the yard in the evenings by our camper, and our hosts have adorable cats :) We would definitely stay here again if our travels bring us back near Missoula! Travelcat was very accommodating when my family and I were planning what to do and when to come and even graciously handled a last-minute (2 days prior) change to our plans. They were super-nice, with local recommendations and a great spot with electricity. Couldn't have asked for a better experience in their neck of the woods. We want to thank Travelcat for being our host this week. The site was as described and very level I might add and easy to park in. Travelcat was very prompt with correspondence. I can recommend this host without hesitation. Once again, THANK YOU, Travelcat. Travelcat was away when we visited, but they graciously allowed us to park on their site. Pity we didn't meet up, but did meet the friendly neighbours, and enjoyed the local icecream place! Travelcat was nice enough to let us stay at her place even though she was on her own trip! We were greeted by a bunch of deer wandering the streets in town! Very cool. It was a lovely stop on our way to Glacier national park. Thanks so much for letting us stay at your place! We had a great experience staying with Travelcat. They are a wonderful couple that were extremely accommodating. They are a day drive away from Glacier National Park which we absolutely recommend going to. Jim was even nice enough to try to fix our refrigerator for us, which unfortunately has not been working properly. It was a pleasure getting to know the two of them and touring the area. If we are ever back in the area, we would absolutely visit or stay with them again. Travelcat's place was wonderful! Near the woods and lake in a peaceful setting. I really enjoyed meeting her and her beautiful kitties. She's such a nice lady! This was my very first Boondocking experience and it was certainly a great way to start!! I dare you to try and find nicer people on the planet! Cindy and Jim are simply incredible hosts in a great location. Spent the night here on the way to Glacier National Park and had such a wonderful time! There are cute little shops and restaurants just blocks away along with delicious soft-serve ice cream just around the corner. Don't miss an opportunity to meet them should you get their way! Oh, and don't forget the kitties! Thank you Jim and Cindy!